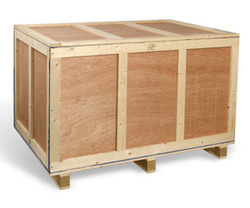 Established and incorporated in the year 2009, AB Packing & Forwarding is a highly eminent and reckoned manufacturing name of a wide assortment of wooden products including an impeccable collection of Wooden Boxes, Plywood Boxes, Carton Boxes, Pinewood Pallets, Wooden Crates, Air Bubble Sheets, Stretch Wrapping Pallet, Packaging Cover and Stretch Wrapping Film. We are also engaged in providing Heavy Machine Packing Service. We ensure that the products we deal with are composed of utmost precision and resilience so as to lay in full conformance to the purpose they are being used for. Moreover we provide these products at the best of market rates via convenient payment modes so as to fit as per the ease of our clients from across the nation. Also we have employed a best team of expertise who is made in charge of carrying concise inspections on the product’s quality in which we deal.